The San Diego California ligament sprain injury lawyers at DiMarco | Araujo | Montevideo have spent their careers helping people with injuries like ligament sprains. We know how badly an injury can affect your routine and your life and we want to help you heal and recover both physically and monetarily. Let us help if you have sprained a ligament while you were working, in an accident, at a business, at a park or because of another person’s negligence. Our San Diego work injury lawyers have dedicated themselves to being up to date on injury case laws, precedence, law changes, and statutes in California so we are prepared to take your case. We are ready to maximize the compensation that you legally deserve. Call our personal injury and work injury law firm at (619) 946-6466. We pride ourselves on giving you complete answers to your questions and concerns. Ligament sprains can be very painful and they can take quite a bit of time to fully heal. The chance of re-injury is high until the ligament has healed. Ligaments are sprained when too much pressure against a ligament causes it to go beyond its operating range. This extra extension could cause a full or partial tear. The medical terms sprain and strain do sound quite alike and they are easy to confuse. They, however, have an important difference. Sprains refer to injuries to ligaments while strains refer to tearing muscles and surrounding tendons. The grading system for ligament sprains is based mainly on how torn the ligament is. Grade 3 sprained ligaments do cause quite a bit of pain because the ligament has torn fully. The joint may not feel stable or strong enough to use. There usually can be heard an audible “popping” sound with sprains of this grade. Grade 2 ligament sprains are less painful than grade 3 sprains. It is difficult to put weight on the injured ligament without the use of crutches. The patient may also lose some of their normal functions temporarily and these injuries have an increased amount of bruising, swelling, and tenderness. Grade 1 ligament sprains are the mildest and they usually do not affect the strength of the joint. Our ligament sprain injury lawyers have successfully represented ligament sprain cases over the past 30+ years. Here are the most typical causes for ligament sprains: work injuries, auto/car accidents, slip, trip and fall injuries, sports injuries (eg: baseball, tennis, wrestling, soccer (especially women’s soccer for knee ligament sprains), racquetball, rugby, football, softball and running), staircase accidents, bicycle accidents, pedestrian accidents, crosswalk accidents, motorcycle accidents, job accidents, defective products, walking or running on an uneven surface, construction site accidents, sudden twisting and trying to stop your body’s motion too quickly or awkwardly. Ligament sprains are still a common injury for workers. The most common ways an employee sprains their ligaments while in the scope of their employment include: tripping, falling, accidents with work, factory, farm or construction equipment, lifting heavy objects, and stopping or rotating too quickly. The San Diego work injury law firm of DiMarco | Araujo | Montevideo is prepared to represent you for your workers’ compensation claims as well as personal injury cases for ligament sprain injuries. We will proactively protect your rights as your employer is legally obligated to pay you disability while you cannot work because of a work injury. Ligaments can be found where two bones join together. The typical ligaments that are sprained include: knee ligament sprains, lateral collateral ligament (LCL) sprains, medial collateral ligament (MCL) sprains, anterior cruciate ligament (ACL) sprains, sprained ankles, posterior cruciate ligament (PCL) sprains, high ankle sprains, ulnar collateral ligament (UCL) sprains, patellar tendon (PTL) sprains, toe sprains, finger sprains, wrist sprains, and elbow sprains. You should always get medical attention or assistance for any injury as it is crucial to treat injuries as soon as possible. The following signs are critical reasons to call for help immediately: You heard a “popping” sound as the injury occurred, the injured area feels numb, there is quite a bit of pain, you cannot put pressure on the extremity, or it is hard to feel or use the extremities, significant swelling, or you have a high fever or open wounds. The medical professionals will figure out if the ligament was fully or partially torn and what the correct treatment plan will be. Surgery is one possible solution for severe cases of sprains. Tommy John Surgery, which has been conducted on many professional baseball pitchers after a ligament injury, is a famous example of a surgery for a ligament sprain. 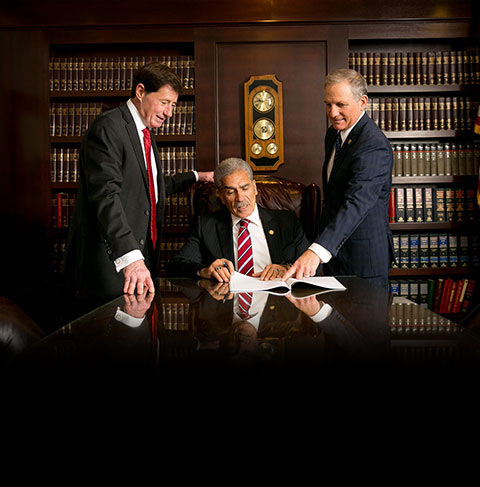 We give all potential clients free initial consultations and case evaluations as they are meant to help you get to know us while discussing your specific case, questions and concerns with one of our seasoned attorneys. We work on a contingency basis so you will not owe or pay us anything unless and until we win your injury case. The ligament sprain injury lawyers at DiMarco | Araujo | Montevideo San Diego will come to your house or hospital room if you are unable to make it to our office. We are available to meet Monday through Friday between 8:30am to 5:30pm. By appointment, we will meet all other times including Saturdays, Sundays and in the evening. You can try to prevent ligament sprains by always being mindful of what the proper form is while turning your body, twisting, lifting, running, or playing sports, starting your workout, workday, activity, or sport slowly with a warm-up and then stretching, and keeping your body in good physical and cardio shape. One reason for knee replacements is if there are ligament tears around the knee. Many partial or total knee replacement surgeries that happen today use a technique where the surgeon has to remove or damage the anterior cruciate ligament (ACL) and posterior cruciate ligament (PCL).